An onslaught of wildfires across a wide swath of Northern California broke out almost simultaneously and grew exponentially, swallowing up properties from wineries to trailer parks and tearing through both rural towns and urban subdivisions. SANTA ROSA, Calif. — Hundreds more firefighters and law enforcement officials headed Tuesday to Northern California to battle wildfires that have killed at least 13 people, including a 100-year-old man and his 98-year-old wife who were unable to escape their burning home. Authorities hoped cooler weather and lighter winds would help crews get a handle on the fires, which are among the deadliest in California history and are still burning completely uncontained. The extra firefighters came from throughout California and Nevada. The extra law enforcement officers will help with evacuations and guard against looting, Alexander said. At least 100 people have been injured and 2,000 homes and businesses destroyed, according to authorities, who warned that all those figures were expected to climb in the coming days as more information is reported. Among the dead were Charles and Sara Rippey, who were married for 75 years and lived at the Silverado Resort in Napa. “The only thing worse would have been if one survived without the other,” their daughter, Ruby Gibney told Oakland television station KTVU. More than 400 miles away, flames imperiled parts of Southern California, too. Thousands of people were displaced by a wildfire that destroyed or damaged 24 structures, including homes. Hot, dry Santa Ana winds swept fire along brushy outskirts of Orange County suburbs and equestrian properties southeast of Los Angeles. More than a dozen schools were closed. At the other end of the state, residents who gathered at emergency shelters and grocery stores said they were shocked by the speed and ferocity of the flames. They recalled all the possessions that were lost. “All that good stuff, I’m never going to see it again,” said Jeff Okrepkie, who fled his neighborhood in Santa Rosa knowing it was probably the last time he would see his home of the past five years standing. Some of the largest of the 14 blazes burning over a 200-mile region were in Napa and Sonoma counties, home to dozens of wineries that attract tourists from around the world. They sent smoke as far south as San Francisco, about 60 miles (96 kilometers) away. Sonoma County said it has received more than 100 missing-person reports as family and friends sought to locate loved ones. It’s possible that many or most of the missing are safe but simply cannot be reached because of the widespread loss of cellphone service and other communications. The flames were unforgiving to both groups. Hundreds of homes of all sizes were leveled by flames so hot they melted the glass off of cars and turned aluminum wheels into liquid. Former San Francisco Giants pitcher Noah Lowry, who now runs an outdoor sporting goods store in Santa Rosa, was forced to flee in minutes along with his wife, two daughters and a son just over 2 weeks old. “I can’t shake hearing people scream in terror as the flames barreled down on us,” Lowry said. A 90-mile (145-kilometer) stretch of the highway is framed by the flames and a major concern overnight, said Brad Alexander, a spokesman for the California Office of Emergency Services. 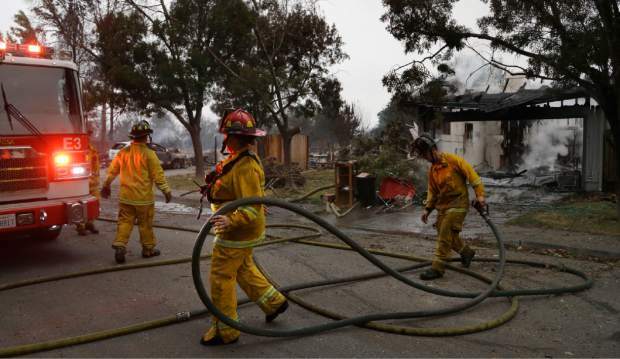 Firefighters rushed to a state home for the severely disabled when flames reached one side of the center’s sprawling campus in the historic Sonoma County town of Glen Ellen. Fires from ruptured gas lines dotted the smoky landscapes of blackened Santa Rosa hillsides. Fire trucks raced by smoldering roadside landscaping in search of higher priorities. Late Monday, flames began coming over a ridge in an area bordering Oakmont and Trione-Annadel State Park, Santa Rosa Police Sgt. Summer Black told the Santa Rosa Press Democrat (http://bit.ly/2wLgBge ). Most of the Oakmont area was evacuated earlier in the day.